The disappearance of Amelia Earhart is one of the most enduring mysteries of the 20th Century. The pioneering aviator went missing somewhere over the Pacific back in 1937 as she attempted to fly around the world, and there have been a host of search parties ever since. Now a new team says that they have found clues to her whereabouts and they believe that they have discovered her final resting place at last. According to this story from Discovery.com, researchers now believe that Earhart and her navigator Fred Noonan crash landed on Nikumaroro Island, an uninhabited atoll that is part of the tiny nation of Kiribati in the South Pacific. They believe that not only did they survive, but that they attempted to use the plane's radio to signal for help on numerous occasions. Some of those SOS attempts were recorded and the researchers studied them, concluding that 57 of the 120 transmissions that were examined have some credibility as belong to Earhart. The research team behind the study says that they believe that Earhart and Noonan were able to continue broadcasting signals until the plane was eventually pulled out to sea by high tides a few days after the crash. They have reviewed tidal data for July 2 through the 9 of 1937 as well, and that data holds well to their theory. The thought is that the two survived the crash and lived on the island as long as they could before eventually dying there. If the radio signal evidence wasn't enough, explorers have also found another clue on Nikumaroro. While searching for evidence of Earhart's eventual resting place, they found five fragments of a glass jar. When that jar was reassembled it was discovered to be Dr.‭ ‬C.‭ ‬H Berry's Freckle Ointment, which was on the market at the time of Earhart's flight. It was also known that she not only had freckles but didn't like them, and used cosmetics to cover them up or in an attempt to remove them altogether. Some of the researchers believe that this jar belonged to the aviator. Next July the team intends to mount an expedition to the island to search once more for the aircraft. 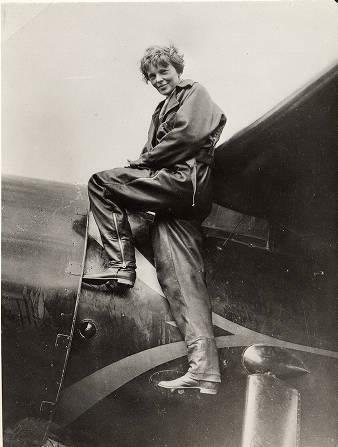 Of course, this will be just the latest attempt to find her and while efforts in the past have provided intriguing clues, the mystery of what happened to Earhart has yet to be solved. It should be very interesting to see what it is they discover. no, I would rather not thank you very much, and I was peuhsd (verbally) until I started raising my voice. Understanding that it was necessary for them to get the closure, I didn't want to remember her that way, but rather, and not to be trite, but how she lived.On another note, it is with fascination that I find out about mysteries or where the strings are, but kind of sad when I do find out. But it is more of a rush to figure out where the strings are with out looking them up on the net or out of a book.I bought a puzzle box, and spent about 3 hours putzing with it, found what I believed to be the opening spot, but it wouldn't budge (found it about 20 minutes in) spent the rest of the time trying to leaver it open with out breaking it.Ended up looking it up to discover that I was right, but the forum stated that this particular model would be stuck some times and you had to break it, sand a bit of wood, glue it together and then it would be fine. I was glad I was right, but I think ultimately I would have been happier if I had been proven right with out having to look it up.jf out.